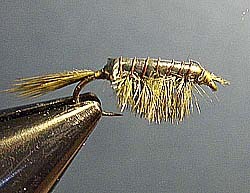 I got the inspiration for this fly from Gary LaFonaine's book, Fishing the Mountain Lakes. 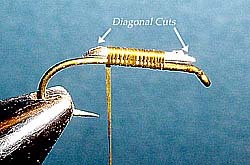 It's essential feature is that it is tied with weight along the top of the hook shank., it's turned over point up, but when it is stripped, it turns right side up. This action seems to be pretty enticing to fish. Back: Scud back--see comment below. The scud back is a strip of plastic 1.8--3/16 " wide. A piece of plastic baggie, something fancy for the fly shop. Most anything will do. I have been using the metallize plastic packaging that static sensitive electronic components come in these days. 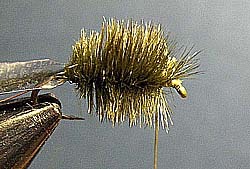 Cut off the weighting wire with another diagonal cut about opposite the barb..
Cover the weight with thread and tie in some hen hackle fibers for a tail.. 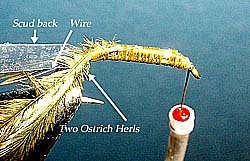 Tie in the wire, the scud back and two ostrich herls. Wrap the herls closely to the eye and tie them off. Fold the scud back over the top and tie it off at the eye, wrapt the rib in spaced turns, tie it off, whip finish, and you're done.